Another big day for progress. I am now off CPAP for 6 hours at a time and then back on for 6 hours which is much more comfortable. My room was quiet today and for most of the day I did not have any room mates so I got some good quality sleep in. Mum and Dad came to see me this morning and bought the daily milk supply. I'm now drinking 6ml every hour and almost back up to my birth weight. Hopefully in a day or so I can come of CPAP for good, and later tonight they are taking out my long line which currently feeds me the Total Parenteral Nutrition. 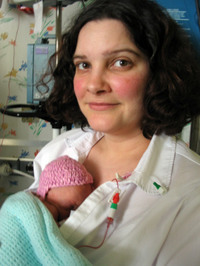 Then I will just be fed my Mums milk and some occasional dextrose via a drip. So all in all a great day for me, hope to see you tomorrow, bye. Today I'm drinking even more milk and have had all the drips removed so both my arms are free of stuff! All I have now is the CPAP tubes every for 6 hours on then 6 off. Mum and Dad came in this afternoon and Mum stayed with me all afternoon. She had a go at feeding my via the tube in my mouth and also we had a cuddle out of the incubator again for well over an hour (most of which I slept through). Mum had a bit of a lesson with the other new mums with the ward sister. They talked about lots of practical boring stuff for when I come home. That's all for today, good night. Today was another exciting day in the Special Care Unit. I moved from my first home, the super baby incubator, to a simpler incubator. Now that I have no drips and CPAP only on for half the day I have much less fuss moving about. Mum and Dad came to see me twice today which was great. I had a really close look at them both, keeping my eyes open for about 15 minutes and they both look kinda ok, but a bit fuzzy. Dad fed me twice today and both mum and dad had a cuddle with me on the comfy chair. I also got hick-ups again today and Mum and Dad found the noise very amusing, how rude! So the end of another brilliant day, bye. Day 15: Here come the Normans! Now I'm settling down more I'm allowed a few more visitors so today the Normans descended. In the morning Mum and Dad came in to see be with Grandma & Grandad Norman. I was still on CPAP so was a bit sleepy. The new set of monitors I'm don't seem as good and one of them keeps going off because it can't hear me breath even though I am. Mum did some 'mouth care' today which is where she cleans up my mouth, and wets my tongue, with water and a cotton wool bud. Then in the evening Mum and Dad came back this time with Uncle Andrew and Auntie Eryl. I was off CPAP by then so was doing lots of yawning an stretching to show off my long limbs. Dad fed me my 7ml of milk and everyone held me lots in my new incubator. Today I reached my birth weight! All babies loose weight to start with and Ive now managed to put mine back on. I'm also making progress on my breathing as I'm now off CPAP for 8 hours then back on for 4 hours so I'm almost flying solo. Mum and Dad came to see me this morning and Mum held me outside the incubator again in whats called a 'Kangaroo Care' which is holding me next to Mum and Dads skin. Dad fed me again, I'm now on 7ml per hour, and changed my nappy. He's starting to get the hang of it all. I was found I can lift my head enough to turn over today so I've been showing Mum and Dad what I can do, I was also quite tired so I've been yawning lots and stretching my arms and legs. Today I have come off CPAP completely. If I do well over the next few days then hopefully I won't ever need to go back on it again! Mum and Dad were really happy with the news this morning when they come in to see me. I had the doctors come round first thing so they decided I was doing ok to try it all on my own. Mum and Dad had a go a cuddling me today and we spent a long time looking at each other. I've now learnt to roll my head over so I can change my sleeping position whenever I like. This morning I gave Mum and Auntie Eryl a sup rise as I had moved room. I'm still in the same incubator I was moved to 2 days ago but I'm now out of the intensive ward and into one of the side wards. Also the nurses put some clothes on me today, how strange they feel. My new room is a bit bigger and has more light, so I'm having a good look around everything. I was a bit tired with all the excitement when Mum came to visit but she feed me and changed my nappy before she went. Later this evening Mum & Dad came to visit me and I was a bit more awake. Dad was really impressed with my progress. 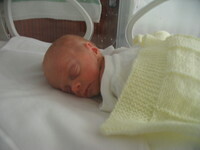 They fed me again and changed my nappy, which took at bit longer now I have clothes on. Then Dad and I had a cuddle for 1/2 hour but I got hick-ups again like yesterday. Anyway far too tired now, good night and God bless. Dad says I've got more hair now and it looks blond. As today is special Mum and Dad took quite a few photos so check out the Week 3 Photo Gallery on the right of the page. Today Grandma & Grandad Johnson came to see me. Its been a while since they last saw me so they were very impressed with my progress. I'm now having feeds every 2 hours instead of every one hour, with 16ml of milk each feed which I think Mum and Dad are glad off as they don't want to feed me every hour when we get home. Mum and Dad changed my nappy again today, but I wriggled lots to make it harder. They also gave me one of my feeds. Other than that I had a very quiet and restful day, which was nice. Bye for now. Today Mum came to visit me this morning. While she was here one of my Doctors, Marcus, told Mummy I was doing AMAZINGLY well and that if I carry on putting on weight I might be able to go home with Mum and Dad in 4-5 weeks! Mum changed my nappy and fed me and we had a cuddle while she stayed with me for most of the morning. She left me in the care of my favourite nurse Pat and left me to rest for the afternoon. 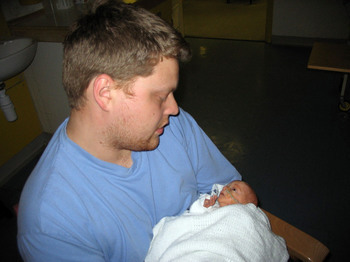 Then this evening Mum and Dad came to see me and Dad held me in his arms for a while. I was a bit uncomfortable and wanted to be left alone so after a bit Mum put me back in my bed so I could settle down for the evening. Today Mum and Auntie Eryl came to visit me in the morning and one of my doctors, Marcus, talked to Mum about me having a transfusion because my haemoglobin levels were low. Lots of premature babies need one or two transfusions and Mum said she nearly had to have one after she gave birth too me so I wasn't too worried. Mum stayed while they put the needle into my arm and I didn't cry at all which the nurses said was very brave of me because most of their patients scream the ward down. There were lots of babies born yesterday so my room had become a bit crowded so later in the afternoon they moved me again! 2 more moves and I'll have visited all of the special care unit except the staffroom and store cupboard ;-). After work Mum and Dad came to visit me and Mum held me for a cuddle again. I tried on Grandma Johnson bonnet whilst I was out of the incubator which was great my first clothes that aren't borrowed. They finished my transfusion and removed the tubing before Mum and Dad left for the evening leaving me chilled out and ready for bed.